PHILADELPHIA (CN) — A federal judge found it constitutional Wednesday for transit officials in greater Philadelphia to block an advertising campaign that called out racial disparities in mortgage lending. 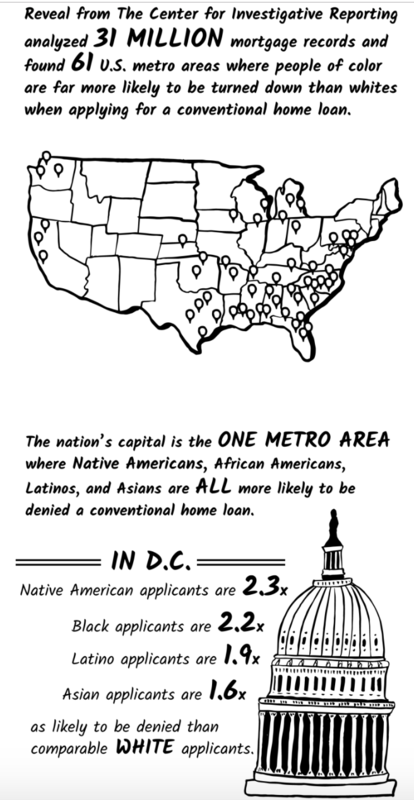 The Center for Investigative Reporting ran this cartoon to promote the findings of a year-long study that documented racial disparities in the mortgage market. Earlier this year, the Southeastern Pennsylvania Transportation Authority rejected a proposed advertising campaign derived from the same study. Represented by the American Civil Liberties Union, the Center for Investigative Reporting had brought the lawsuit here in May 2018. SEPTA, which is short for the Southeastern Pennsylvania Transportation Authority, triggered the group’s ire earlier this year when it refused to accept an ad campaign promoting the center’s year-long study of racial bias in the mortgage market. Though the center argued at a trial that the refusal of its ad amounted to viewpoint discrimination, Baylson concluded Wednesday that the agency applied its rules evenly. SEPTA adopted its politics ban back in 2015 after its earlier policy against public-issue advertising invited a successful lawsuit by the American Freedom Defense Initiative. An anti-Muslim activist group, the AFDI has battled with public agencies across the country for years, but in the 2015 SEPTA case it sought to run an ad featuring a photograph of Adolf Hitler speaking with a leader of Palestine in the 1940s. “Islamic Jew-Hatred: It’s in the Quran,” the advertisement said. Unlike the public-issue policy that was found unconstitutional, Baylson said Thursday that the politics ban passed muster. Concluding that SEPTA has been evenhanded in its application of the political-ad ban, Baylson noted that the agency has fielded nearly 2,736 proposed advertisements in the past three years and found that only about a dozen of them are noncompliant. “It clearly exerts significant control over the advertising review process,” Baylson said of SEPTA. ACLU attorney John Stapleton has not returned a call requesting comment on the ruling. SEPTA attorney Maryellen Madden deferred all comments to SEPTA General Counsel Gino Benedetti. When the case went to trial last month, Benedetti was the only witness to testify. The trial lasted just one day, and Judge Baylson heard closing arguments on Nov. 1. Benedetti has not returned a call requesting comment.